The Nicoya Peninsula of Costa Rica offers a unique opportunity with the use of GPS technology to advance the understanding of subduction zone dynamics as it is situated above an active seismogenic zone. Most such zones are typically located offshore. 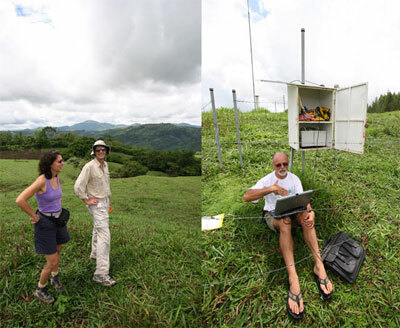 A collaborative research effort between Dr. Tim Dixon of University of Miami/RSMAS, Dr. Susan Schwartz of UC Santa Cruz, and Marino Protti of Universidad Nacional, OVSICORI in Costa Rica with the support of Unavco resulted in a recent deployment of a prototype network of four permanent GPS. Prior to the deployment several reconnaissance trips were made, the first of which took place in June 2005. During this time the collaborators from OVSICORI were met who assisted with travel logistics and site selections. During the second trip in January 2006 several more potential sites were visited and final selections were made. It was decided that two deep drilled braced monuments (DDBM) and two short drilled braced monuments (SDBM) would be installed and would model the sites after PBO. In addition to the field work, the drilling contractor and sources for the raw materials for the monumentation were found. The DDBM monuments in Nicoya are the first of this type to be deployed on international soil by UNAVCO. This is the first phase of installations of a larger future effort involving multiple GPS and other sensors. Most of the sites will use a cellular GSM system for data transfer to OVSICORI. Data will be retrieved over Internet by both UNAVCO and the Geodesy Lab at the Rosenstheil School.